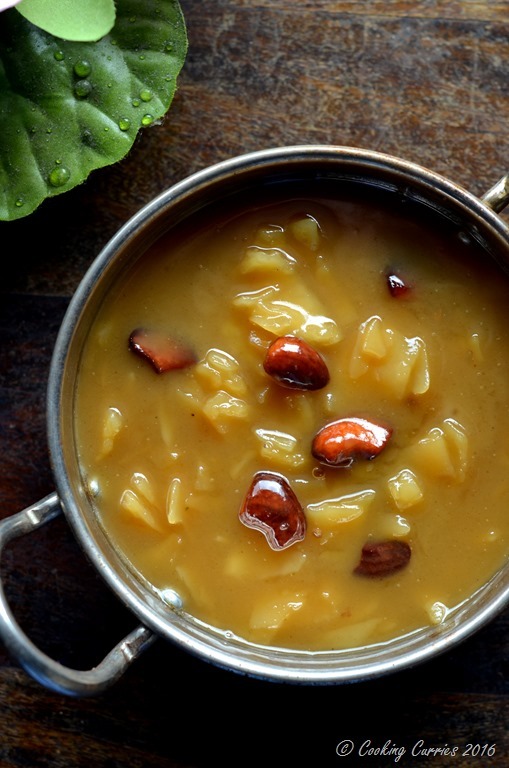 A rich and delicious Ada Pradhaman – Rice Pasta Pudding that is sweetened with jaggery and made fragrant with cardamom and coconut milk. 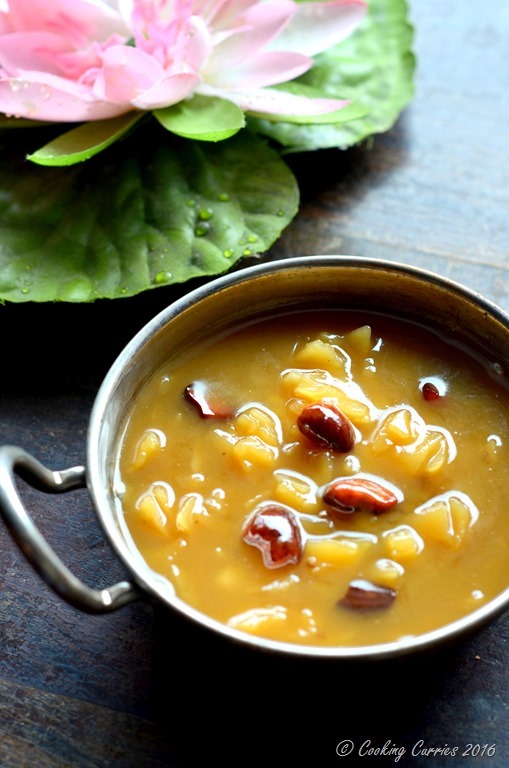 I have written about this before – about the two camps of payasams / puddings that exist. The one with regular milk and sugar as the base and sweetening agent and the other with the coconut milk and jaggery as the base and sweetening agent. Every malayali ( a person from the Southern state of Kerala in India) has his or her preference to one of the camps. Well, dessert lovers like me find it hard to pick one or the other, but if given a hard choice of only one kind, I would pick the coconut milk and jaggery side. There is some form of richness and depth in flavor that comes with this kind of preparation that the regular milk and sugar just cannot bring. At least in my opinion. I am sure there are a few others out there who would disagree with me. Here is the recipe of the same exact rice pasta that I made with milk and sugar Slow Cooker Pal Ada Pradhaman. Make both for yourself and decide for yourself which camp you belong to! Here are other Kerala Sadya recipes, in case, you came here looking for those. I have included a pretty exhaustive list from pickles and condiments to vegetable sides to curries to payasams. Hope you enjoy it! This recipe has used ghee to fry the cashew nuts. To make it vegan friendly simply substitute ghee with coconut oil and you are all set. Wash the ada well and cook it in the 2 cups of water until it is a little softer than al dente. Drain, rinse to separate the ada pieces and keep aside. Meanwhile, add the jaggery to a heavy bottomed pan and add the water to it. Melt the jaggery over medium low heat. Remember that as jaggery melts, it releases water, just like sugar. Add the drained ada pieces to this and let it cook in it. Once the mixture thickens a little, add the cardamom and mix it in. Add the coconut milk and let it continue to cook and thicken over medium heat. Once it has come together and thickened a little, remove from heat and add the coconut cream. Wait for 2 minutes and mix it in. In a small pan, heat the ghee / coconut oil and fry the cashew nuts and coconut slices in it. Pour it over the payasam / pudding. Serve hot or cold. 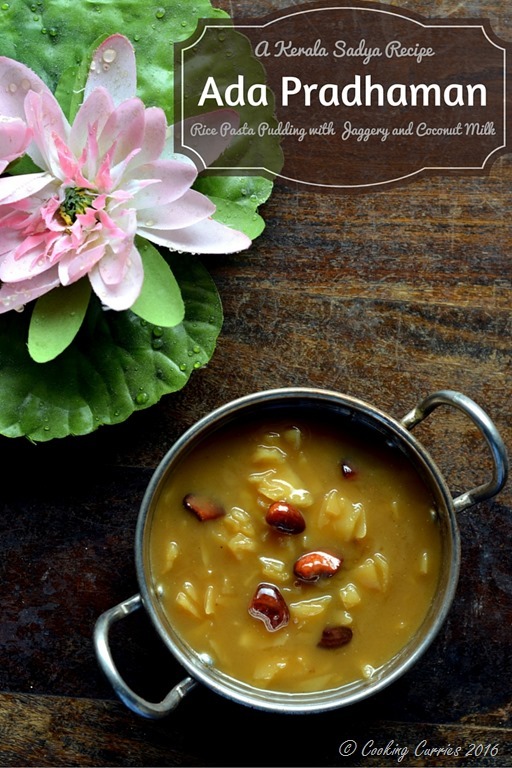 Tried this recipe?Mention @Cookingcurries or tag #cookingcurries on social media. We would love to take a look and share!